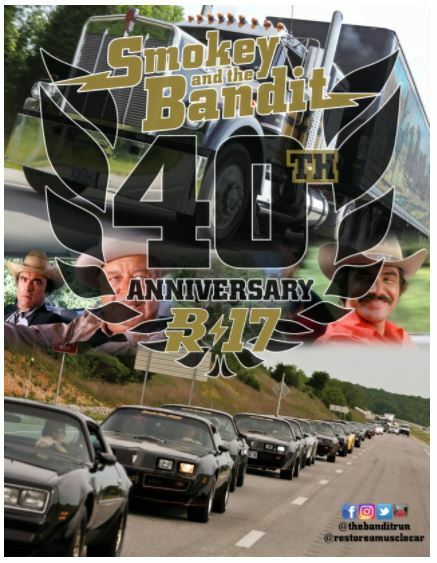 The 11th Annual Bandit Run, will be celebrating 40 years of Smokey and the Bandit with the biggest and best Bandit Run yet. The Bandit Run, brought to you by RESTORE a MUSCLE CAR in Lincoln, Nebraska, is a week-long traveling car event that will let you get your classic cars out on the open road. This year’s Run already has over 250 registered cars and more than 500 attendees ready to hit the road. Enter to win your own Bandit Trans Am autographed by Burt Reynolds at www.winthebandit.com and use promo code: WB0517X for bonus tickets.